Mumbai – the ‘sandwich’ city! 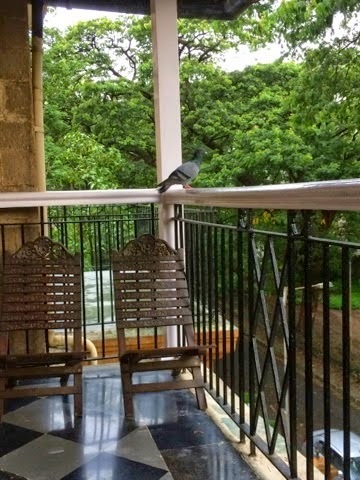 It’s 6:20 am and as I laze around gently swinging on the cane chair in my balcony, listening to the sweet chirping of the birds, feeling the cool monsoon breeze in my hair and the quiet solitude, it is hard to believe that I am in the city of Mumbai. Give it a couple of hours and the same place will metamorphosise into something totally different. The park opposite that now stands empty will be filled with young enthusiastic boys playing football, the school right behind my house will start filling in with children, their eager parents dropping them off filling the narrow streets with their bulky cars and filling the air with their non-stop honking sounds. Then the daily vendors – the newspaper-wala, the doodh-wala (milkman), the istri-wala (ironing man), the bhaji-wala (vegetable vendor) fill in the few peaceful sound bytes with their loud calls. Almost in the span of a few hours this place will turn into what it is famous for – a gaudy, cacophonous mayhem of people and noises. Once that happens you can never be alone here. This very peaceful balcony that I run to, when my senses are too overwhelmed with the ‘love’ and ‘warmth’ extended by the city, is also not a safe place to hide, as a neighbour passing by might spot me and try making a conversation from two levels below or the bhangar-wala (recycle-man – if I may call him?) might see me catching a wink and call out “Bai, kai bhangar che?” (Madam, do you have anything to re-cycle?”) Out in public – in a local train “Bai jara sarka” (Please shift in a bit), in a building lift “Thoda andar jaaon” (Please move in a bit). Waiting patiently in the pouring rain for my roadside chutney sandwich to get made, I can’t help but relate all the cut vegetables being about to get crushed into a sandwich toaster, to our lives outside, with extra cheese of course! It’s amazing how people infiltrate each other’s lives here. What’s more amazing is how this invasion of privacy becomes your safety net when you really need something done, or need someone in case of an emergency. You do not have to think twice before stopping a stranger on the road, asking him to give your broken-down car a little ‘dhakka’ (push) or before barging into your neighbour’s house asking that she look after your sick child till you finish your errands or walking into your friend’s house for an impromptu tea-break! It is this dependency, this ”ease” of life that stopped me from moving out of my country for a very long time and now the same factors make me hesitate from wanting to settle back here. However a few weeks of living here and the city will slowly and steadily creep up on you, catch you unaware and sandwich you, in it’s love, it’s devotion, it’s culture, it’s colours, it’s population, it’s poverty and it’s dependency. Just six weeks into it and I have to shake that ‘needy’ feeling off and get geared for life back in Hong Kong. There are thousands like me who wish to stay away from this mayhem and yet year after year come running back to get assaulted! Even the birds don’t leave you alone here as this crow is cawing out loud, non-stop perched on my balcony sill! Sandwich city and Mumbai. How true! I live the comfort that it gives to my life, where plain strangers can help. I’m so dying to be back where life is lived like the Tezz local. Loove the balcony view..lemme take a guess, the beautiful Parsi colony, right?! I’ve been there once at Mumbai Central..i mean had some relatives there. Your composition is worthy of nothing less than awe and praise. Not only have you captured the essence of Mumbai’s topsy-turvy culture, but you have also struck a nostalgic cord, making one pause for a moment and reflect on how we miss the simple fineness of life. You are such a fine writer….and I love it when you are pouring your heart through your blog…. Thank you so much Faiyaz. It is comments like these that truly keeps me going, writing my blog even at midnight, when I am questioning my own sanity, wondering why I write and to what end? Thank you answering my questions and please do continue reading. So agree with you Mehroo! I have never ‘lived’ in Mumbai but after spending these 2 weeks in this crazy city, I have a certain respect as well as sympathy for people living here. The best part of the city is its vibrancy and the worst was the commute – no proper public transport hence heavy traffic! I love your line ‘thousands who wish to stay away from this mayhem and yet year after year come running back to get assaulted’!! I guess a part of it is to just spend some quality time with our loved ones and also because we know its only for a finite period of time. Hi Reena, yes it’s amazing isn’t it? Holidays were tougher when the kids were younger but this time I explored the city much more in a local way. More family gatherings, more kids in the family, more chaos and much more fun! What I would love to know is what an expat family feels/does living there? Beautifully written Mehroo. .. missing u and the lunch at Cafe Mysore.